Categorized by theme, January’s batch of Muslim persecution of Christians around the world includes (but is not limited to) the following accounts, listed in alphabetical order by country, not severity of anecdote. Iran: A Christian convert who was arrested in her home has been sentenced to two years in prison. Previously she endured five months of uncertainty detained in the notorious Evin prison, where the government hoped she would come to her senses and renounce Christianity. She was convicted of “broad anti-Islamic propaganda, deceiving citizens by formation of what is called a house church, insulting sacred figures and action against national security.” Likewise, Iranian Pastor Yousef Nadarkhani continues to suffer in prison. Most recently, he rejected an offer to be released if he publicly acknowledged Islam’s prophet Muhammad as “a messenger sent by God,” which would amount to rejecting Christianity, as Muhammad/Koran reject it. Kuwait: A royal prince who openly declared that he has converted to Christianity, confirmed the reality that he now might be targeted for killing as an apostate. Norway: While out for a walk, two Iranian converts to Christianity were stabbed with knives by masked men shouting “infidels!” One of the men stabbed had converted in Iran, was threatened there, and immigrated to Norway, thinking he could escape persecution there. Zanzibar: After being robbed, a Muslim convert to Christianity called police to his house; they discovered a Bible during their inspection. The course of inquiry immediately changed from searching for the thieves to asking why he “was practicing a forbidden faith.” He was imprisoned for eight months without trial, and, since being released, has been rejected by his family and is now homeless and diseased. Azerbaijan: A pastor has been threatened with criminal proceedings following a raid on his church during Sunday service. Earlier, he was told that “a criminal case had been launched over religious literature arousing incitement over other faiths,” and was pressured by authorities to leave the area, which he did, traveling great distances each week to lead church services. Egypt: Before a bishop was going to inaugurate the incomplete Abu Makka church and celebrate the Epiphany mass, a large number of Salafis and Muslim Brotherhood members entered the building, asserting that the church had no license and so no one should pray in it. One Muslim remarked that the building would be suitable for a mosque and a hospital. Indonesia: A sticker on the back of the car of a member of the beleaguered Yasmin church saying “We need a friendly Islam, not an angry Islam,” distributed by the family of the late Muslim president, prompted another Islamic attack on the church: scores of Muslims “terrorized the congregation and attacked several church members.” Since 2008, the congregation has been forced to hold Sunday services on the sidewalk outside the church and then later in the home of parishioners. Not satisfied, hundreds of Muslims later searched and found the private home where members were congregating and holding service and prevented them from worshiping there as well: “It crosses the line now. The protesters now come to the residential area, which is not a public place.” A new report notes that anti-Christian attacks have nearly doubled in the last year. 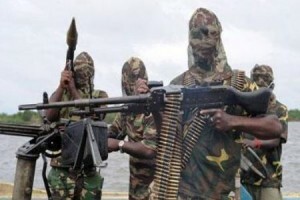 Nigeria: Soon after jihadis issued an ultimatum giving Christians three days to evacuate the region or die, armed Muslims stormed a church and “opened fire on worshippers as their eyes were closed in prayer,” killing six, including the pastor’s wife. Then, as friends and relatives gathered to mourn the deaths of those slain, “Allahu Akbar” screaming Muslims appeared and opened fire again, killing another 20 Christians. Several other churches were bombed, and seven more killed. Pakistan: Enraged by the voices of children singing carols at a nearby church, Muslims praying in a mosque decided to silence them—including with an axe: “The children were preparing for mass to be celebrated the next day which was a Sunday. The loud cheers became terrified whimpers when suddenly four men, one of them with an axe, barged into the church. The men slapped the children, wrecked the furniture, smashed the microphone on to the floor and kicked the altar. “You are disturbing our prayers. We can’t pray properly. How dare you use the mike and speakers?” (Islam forbids Christians from celebrating loudly in church, banning bells, microphones, etc.) Also, a center owned by the Catholic church for 125 years, and used for “charitable purposes”—it housed a home for the elderly, a girls’ school, a convent and chapel for prayer—was demolished, after it was discovered that its land is worth much money; in the process, demolition workers destroyed Bibles, crosses, and a statue of Our Lady. Denmark: In Muslim majority Odense, an Iranian Christian family had two cars consecutively vandalized—windows smashed, seats cut up, and set ablaze—because the cars had crucifixes hanging in them; the family has since relocated to an undisclosed location. Likewise, “Church Ministry” will change its name to “Ministry of Philosophy of Life” to accommodate Muslims. Egypt: In the latest round of collective punishment, a mob of over 3000 Muslims attacked Christians in a village because of a rumor that a Coptic man had intimate photos of a Muslim woman on his phone (denied by the man). Coptic homes and shops were looted before being set ablaze. Three were injured, while “terrorized” women and children who lost their homes stood in the streets with no place to go. As usual, it took the army an hour to drive 2 kilometers to the village and none of the perpetrators were arrested. Nigeria: Boko Haram Muslims set ablaze a Christian missionary home. Occupants of the home, mostly orphans and the less-privileged, were rendered homeless as a result. Meanwhile, a top officer allowed the mastermind behind the Christmas Day church bombings to escape, evincing how well entrenched Islamists are in government. Pakistan: A judge has denied bail to the latest Christian charged with desecrating the Koran, under Pakistan’s blasphemy laws, despite the lack of evidence against him: according to Sharia, the word of a Christian is half that of his Muslim accuser (his landlord). Saudi Arabia: Officials strip-searched 29 Christian women and assaulted six Christian men after arresting them for holding a prayer meeting at a private home. Imprisoned last month without trial, they have not been told when or if they will be released. Authorities conducted the strip searches of the women, who insisted they had committed no crime, in unsanitary conditions. As a result, some of the women have been injured and are suffering illnesses, but authorities have provided no medical treatment. Sudan: Authorities threatened to arrest church leaders if they engage in “evangelistic activities” and fail to comply with an order for churches to provide names and identifications: “The order was aimed at oppressing Christians amid growing hostilities toward Christianity… Sudanese law prohibits missionaries from evangelizing, and converting from Islam to another religion is punishable by imprisonment or death in Sudan, though previously such laws were not strictly enforced.” Accordingly, days and weeks later, two evangelists were arrested on spurious charges and beat by police. Sudan: After a large truck smashed through the gates of a Catholic Church compound, Muslims affiliated with Sudan’s Islamic government kidnapped two Catholic priests and “severely beat” them and looted their living quarters, stealing two vehicles, two laptops and a safe. Later, the kidnappers forced the priests to call their bishop with a ransom demand of 500,000 Sudanese pounds (US$185,530). Switzerland: A Muslim man hacked his daughter to death for dating a Christian: were they dating in a Muslim-dominated country, the Christian, as so often happens, would have likely received similar treatment. Syria: The Christian community in Syria has been hit by a series of kidnappings and brutal murders; 100 Christians were killed since the anti-government unrest began; “children were being especially targeted by the kidnappers, who, if they do not receive the ransom demanded, kill the victim, including some who are “cut into pieces and thrown in a river.” These latest reports are reminiscent of the anti-Christian attacks that have become commonplace in Iraq for a decade. Tajikistan: A young man dressed as Father Frost—the Russian equivalent of Father Christmas—was stabbed to death while visiting relatives and bringing gifts. The Muslim mob beating and stabbing him screamed “you infidel!” leading police to cite “religious hatred” as motivation. Accordingly, whatever the anecdote of persecution, it typically fits under a specific theme, including hatred for churches and other Christian symbols; sexual abuse of Christian women; forced conversions to Islam; apostasy and blasphemy laws; theft and plunder in lieu of jizya (tribute); overall expectations for Christians to behave like cowed “dhimmis” (second-class citizens); and simple violence and murder. Oftentimes it is a combination thereof.